The Fort near Veldhuis is home to the Luchtoorlogmuseum (Aerial Warfare Museum). It houses an exhibition of various objects related to the Second World War. These range from a variety of articles and drawings to (self-excavated) aircraft parts. A special feature of the fort is located in its front wall. It’s a German searchlight bunker from World War II. During the stronghold’s restoration, the engineer depot was converted into a dwelling. South of the fort you can find a secondary battery. The museum is open every Sunday from May through September. Children under 8 years and Veteran's pass holders can visit the museum for free. The Fort near Veldhuis had the job of defending the causeway coming from Heemskerk/Assumburg. This dike served in part to regulate the accurate flooding of the land on both of its sides (inundation dike). The defensible earthwork was completed in 1893, the shellproof building in 1897. 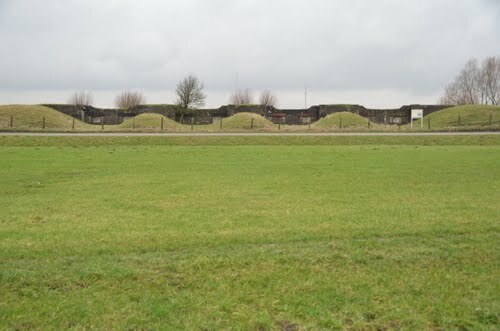 The Fort near Veldhuis and the Fort near Vijfhuizen are the oldest concrete forts that were created according to original 1897 design.